What Should Our Body Fat Percentage Be? How much fat do we really need? In general, the body fat percentage of a fit individual falls in the range of 21 to 24% for women and 14 to 17% for men. For a more specific range see the charts below. Excess body fat has been associated with health risks such as heart disease, diabetes, hypertension, arthritis, gall bladder disease, cirrhosis of the liver, hernia, intestinal obstruction, and sleep disorders. It’s also associated with reduced endurance performance and an increased risk for injury. How is body fat percentage measured? The four most common methods of assessing body composition are hydrostatic weighing, circumference measurements, bioelectrical impedance, and skinfold measurements. 1) Hydrostatic weighing involves suspending your body in a chair, attached to a scale, in a tank of water. It is known as the “gold standard” of body composition assessment because it is one of the most accurate methods; however, it is impractical in terms of expense, time, and equipment. Its margin of error is around 2-3 percent. 2) Bioelectrical impedance is a popular method that is based on the principle that the conduction of an electrical impulse is greater through lean tissue than through fatty tissue. These can range from scales that you stand on to handheld Omron meters (as shown) and beyond. Its margin of error is around 3-5 percent. 3) Circumference measurements using generalized equations that use girth measurements with, also, a 3-5 percent margin of error. 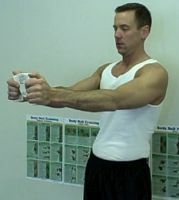 Common sites for measurement are: chest, waist/women, naval/men, hips, thigh, upper arm, and calf. 4) Skinfold measurements using a skinfold caliper and generalized equations based on the sum of measurements at anywhere from 3 to 9 sites. Margin of error is around 3-4 percent. You can usually get a personal trainer at your local gym to perform these for you. As you can see in the picture on the left, I am pinching Joe's abdomen (one of several sites as per various protocol requires) with a skinfold caliper. There are several factors that can affect the outcome of all of the above, hence, the margin of error is from 2-5 percent. For accuracy the body should be well-hydrated and not have exercised within the past 6 hours or consumed any alcohol in the past 24 hours before testing. Of course if you are being pinched with a skin-fold caliper or having girth measurements done, you should try to have the same fitness professional perform the test each time to ensure accuracy. It is imperative to be pinched or measured in the same spot each time or the measurement will be higher or lower due to inaccurate measuring instead of actual change in body composition or size. While the energy available from fat is used throughout the body, exercising muscles can utilize a tremendous amount of fat to produce the energy necessary for muscle contraction. See how it makes sense to tone, condition, and grow your muscle in order to enhance weight loss or maintain weight control? This is why we personal trainers are constantly spouting the importance of strength training along with cardio and a sensible nutrition plan for a total fitness regimen. If you aren’t strength training, you’re leaving out one of the most vital aspects of your plan. Strength training will transform you body composition. So come on! Let’s go lift some weights!